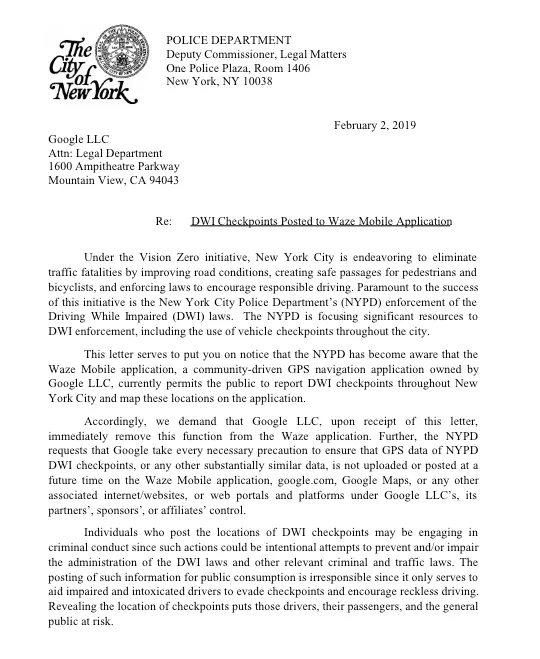 NYPD to Waze: Stop snitching on our checkpoints! prevention. The New York Police Department (NYPD) wants it to stop. to Waze’s owner, Google. It insisted the app’s capabilities should not be allowed and could even be considered illegal. ,” NYPD Deputy Commissioner for Legal Matters and lawyer Ann P. Prunty said in the letter. Although this might seem like it is interfering with proper justice and helps those who are potentially breaking the law, the reality is that it’s an advancement in technology that makes word of mouth easier. This is theoretically no different from somebody driving past a DUI checkpoint and group-texting friends or posting to a local Reddit message board. Telling people something exists is not against the law. Based on a statement given to the the NYT, Google likely agrees and doesn’t sound like it plans to change the app. allows them to be more careful and make safer decisions when they’re on the road,” Google stated, adding that safety is of upmost importance. As of the reports, no official legal action has been taken. We will update the story if and when more information surfaces.